Creative Arts School in Bethesda aims to provide your child with the best in preschool and daycare services. In part one of our blog series, we looked at a few benefits that your child can enjoy by attending summer camp. 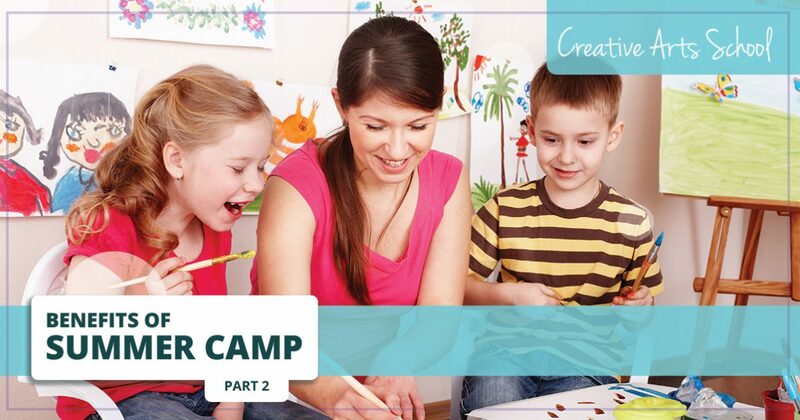 Wrapping things up in part two, here are a few more examples of ways that sending your child to summer camp can be of benefit to them. Being at school offers your child the opportunity to develop their own skills on an individual level, as well as make friends with fellow classmates. While group work is something that happens from time to time during the school year, the ability to work in a group setting is something that is not only beneficial to your child as they go through school, but as they grow into adolescents and adults as well. By sending your child to our summer program in Bethesda, you will be able to help your child develop valuable teamwork skills. As we mentioned in our previous post, our summer program contains a variety of fun and exciting activities, from spending time outdoors to language immersion, creative activities and beyond. Whether they’re playing sports with their fellow campers, participating in an onstage drama production or otherwise, there are plenty of activities in our summer program that put your child in a group or team setting, allowing them to gain an understanding and valuable experience with being a part of a team. The experiences they have and skills they develop by working in a group setting as part of our summer program here at Creative Arts can help prepare them for the countless amounts of team and group work that they will inevitably encounter over the next few years of their life. Whether you’re sending your child to a more traditional summer camp or enrolling them in our summer program here at Creative Arts, sending your child to a summer camp comes with a variety of social benefits, from making new friends to understanding teamwork. Sending your child to a summer camp or summer program can also help them feel a sense of community that they may not necessarily feel in school. While school is a great way to socialize your child and help them be around kids in their own age group, a lot of the day is spent learning and partaking in other educational activities. While these are undoubtedly beneficial for your child’s overall development, all the time spent learning makes for a fewer opportunities for your child to bond with their peers. By attending summer camp or a summer program, however, your child will have far more opportunities to bond with their fellow campers and really develop a rapport with the group as whole. At our summer program in Bethesda, in addition to having a robust language immersion program, where your child can learn the languages and cultures of the world, we also feature a healthy amount of fun and exciting activities throughout the 10 weeks that give your child plenty of opportunities to truly bond with their fellow campers. We take field trips to parks, zoos, farms and museums, like The Smithsonian and the National Gallery of Art. We spend time outdoors every single day doing everything from swimming, tennis, soccer and basketball to free play. All of these activities and more are just a few examples of what make our Bethesda summer program for kids so special, and with all the time they spend with their fellow campers on hikes, field trips and playing outdoors, they’re bound to develop a sense of community with both their peers as well as instructors. Those are just a few more examples of how sending your child to a summer camp can be of benefit to them. As a parent, you want to provide your child with the best education possible, and when it comes to summer vacation, you want to make sure that they are continuing to develop both socially as well as intellectually. Our summer program here at Creative Arts School combines educational aspects, like language immersion, with more common summer activities, like sports and outdoor play, into a unique and fun environment that’s perfect for your child. To learn more about our Bethesda summer program, get in touch with us today!